Want to improve your station's sound quality and loudness but don't have the budget to replace your processing? The Ariane Sequel is a cost effective and easy way to breathe new life into your existing processor. Add this award winning digital leveler and get the sound quality to make you stand out from the crowd. Designed to offer the competitive broadcast a new tool in the arsenal of audio processing, the Ariane Sequel is like no other audio processor in the world. Audio is passed though a sum and difference matrix to produce two signals, the combination of left and right channel (L+R) and the difference of them (L-R). These two signals are independently processor to control the audio amplitude and stereo separation. This process improves the sound quality and boosts loudness without affecting the tonality of the audio. When placed in front of existing processors the combination produces very powerful advantages to FM broadcasters. At it's introduction the Ariane Sequel won Radio Magazine Pick Hit Award. It's BW Broadcast's unique multiband, release gated, 'windowing' feed-forward RMS control that sets the Ariane Sequel above all other levelers. When you need tightly controlled audio levels, but don't want to affect the tonality of the source audio the Sequel shines. It works especially well in an environment where some programming is already processed and other elements aren't. This makes it the ideal preparation processor, optimising the consistency of the final mix from radio and television broadcast consoles. 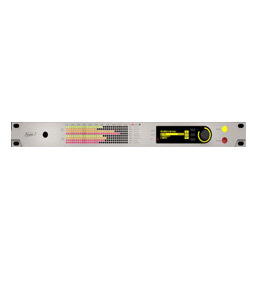 With units installed in broadcast stations throughout the world, the Ariane Sequel is also great as an IBOC/Streaming/Webcasting leveler for a more consistent, listenable sound. Use it on satellite or remote broadcast feeds, production, or mix finalizing. The Ariane Sequel is the heavy hitter of AGC levelers for Radio and Television. It makes things sound better!